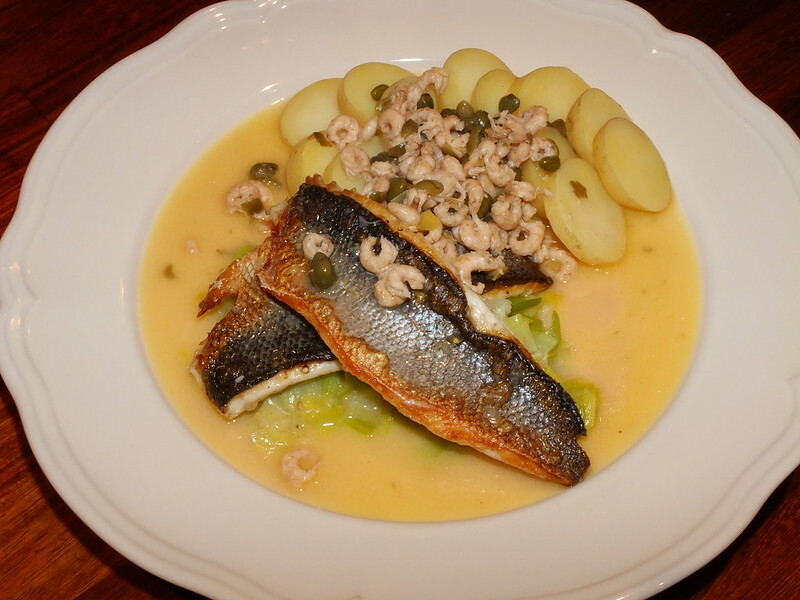 Farmed sea bass is widely available these days and isn’t really that expensive. You can cook the whole fish in the oven or you can fry the fillets. You can get the fishmonger to clean the fish and fillet them for you but as long as you have a sharp knife it isn’t that difficult to fillet the fish yourself. As farmed bass tend to be on the small side, two fillets are probably the right-sized serving for one person. First cook the potatoes in salted boiling water. This shouldn’t take more than about 10 minutes. While the potatoes are cooking, cook the leek in about 100ml of hot water with a decent-sized knob of butter, salt and pepper until soft. Drain off the cooking liquid and put it and the leeks to one side to keep warm. Season the fish fillets and fry, skin side down, in hot olive oil for about 2-3 minutes. Don’t move them or the skin will stick. Melt some butter in a pan and add the wine, bring up the heat and let this bubble for a bit. Add the leek cooking water/butter mix. Throw in the capers and shrimps and let them warm through. Taste and adjust the seasoning and add the lemon juice. Flip the fish over for the last 30 seconds of cooking. You want a nice crisp skin. Drain the potatoes and plate up with the fish, skin side up, on top of the leeks and the potatoes to one side. Spoon over the shrimp, caper and butter sauce. That is pretty much it, except for the wine. I suggest something crisp, chilled and white. Muscadet would be good or a Sauvignon Blanc wine like Pouilly Fumé or maybe a white Bordeaux. The important thing is that it is dry here and not too full-bodied.